over the weekend, little mouse and i (along with my sister-in-law, her two kiddos, and our friend and her family) ran in a 5k in philly called the color run. mark was the official photographer of the day. it is a 3.1 mile run, but not a race. in fact, a good amount of people were walking! as were my sister and i for about half the time, since trying to run with a jogger and a double jogger through the crowds proved to be rather difficult. you wear as much white as possible at the start and by the end you are covered head to toe in colored "paint"! afterwards there is live music and dancing and runners all gathered together throwing more color, dancing, and having a great time. it was such a blast and it's something we definitely plan on doing again. 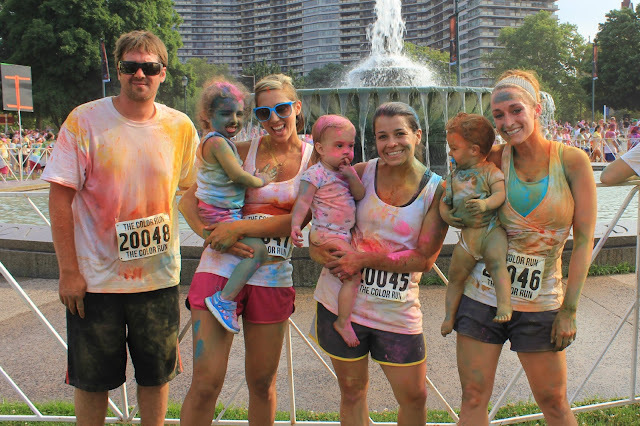 besides being such a FUN event, the color run also partners with local sponsors and charities for each event. the philly run benefited an organization called back on my feet, which "is dedicated to creating independence and self-sufficiency within the homeless and other under served populations by first engaging them in running as a means to build confidence, strength and self-esteem. The organization does not provide food nor shelter, but instead provides a community that embraces equality, respect, discipline, teamwork and leadership. Back on My Feet’s approach focuses on the very profound and innate desire for all of us – regardless of age, race, socio-economic status – to feel recognized, appreciated, valued and important." i love that they go at the problem of homelessness from a different perspective. instead of meeting the physical needs of these people, they are meeting the emotional and psychological. i believe this coincides with our job as Christians in this world to love people no matter what. it doesn't matter who you are or where you're from, how much money you have (or don't have) or the type of clothes you wear: everyone on this earth wants to be loved. i applaud 'back on my feet' for doing such a wonderful service in their communities. 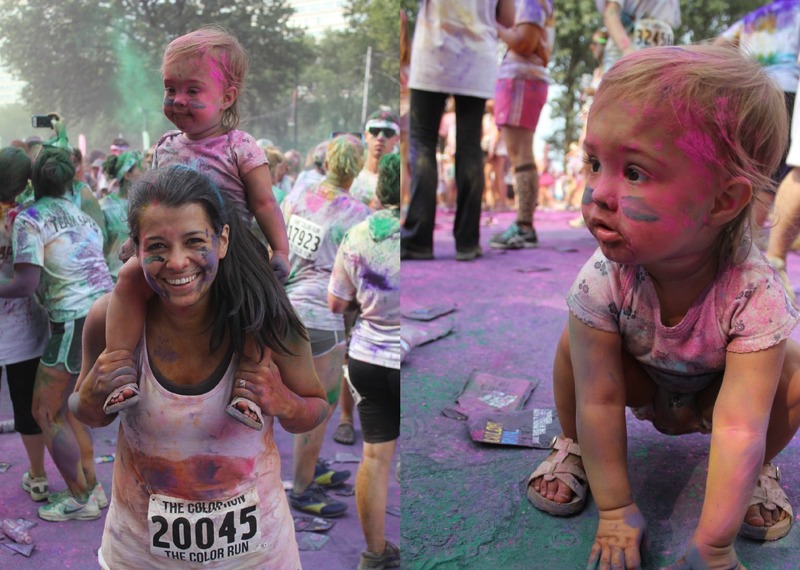 i have to thank the color run for providing an event that i can bring my young daughter to and feel comfortable. she had such a good time (and so did i just watching her enjoy herself!) playing in the paint and dancing away. i know that as she gets older this is something we can do together and she will get something out of it besides just exercise. i want norah to know that Jesus came to die for us ALL and it is important to help and love ALL people as that's what He tells us to do. any activity that is both kid friendly and charitable, and one that reinforces our beliefs, is one that we will absolutely invest our time in. So fun. Love you sister.